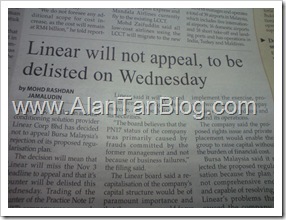 Linear Corp Bhd has decided not to appeal Bursa Malaysia’s rejection of its proposed regularisation plan. Therefore, this counter will be delisted on Wednesday(7 November 2012). The Group is principally engaged as a Heating, Ventilation and Air-Conditioning (HVAC) solution provider. Its activities are mainly confined to a single operating segment, namely the manufacture, sale and operation of cooling towers and district cooling plant. If you use Fundamental Analysis when looking for a company to invest in, you will AVOID this company by just looking at their financial report which was publicly available. In less than 5 minutes, you will be able to tell WHY you must avoid this type of company! If you look at their annual report start from 2002, just look at their Revenue vs Receivable. For the FY 2002, their Revenue is 37,024 vs Receivable is 31,633. This means the company has a lot of debt(more than 80%) that was not collected. It shows the company cannot run their business because lack of cashflow. Cashflow is the blood of the any business as it needed to pay for fixed and variable cost. Fixed cost involved salary, rent, borrowing etc. The trend of bad debt collection continue until today. When you refer to the recent reported top 30 shareholders stock holding, you’ll notice there are about 52% Public free float which is very high. It shows the insiders has unload their stocks long time ago. Therefore, if you wish to invest successfully in Bursa Malaysia, it’s good to study and understand fundamental analysis. It’ll gave some Red Alert on companies to avoid. Reference is made to the Company’s announcement on 4 October 2012. On 4 October 2012, TA Securities Holdings Berhad (“TA Securities”) had on behalf of the Board of Directors of LCB (“Board”) announced that Bursa Securities has vide its letter dated 4 October 2012, decided to reject the Company’s proposed regularisation plan as the proposed regularisation plan does not comply with Paragraph 3.1 (a) of Practice Note 17 of the Listing Requirements which specifies that the regularisation plan must be sufficiently comprehensive and capable of resolving all problems, financial or otherwise that had caused the company to trigger the Prescribed Criteria (as defined in the Listing Requirements). TA Securities, on behalf of the Board, wishes to inform that that the Board has resolved that the Company will not be submitting an appeal to Bursa Securities in relation to the non-approval for the regularisation plan. The above decision was made in view of the financial position of the Company and the subsidiaries (collectively known as the “Linear Group”) which is in an urgent need to be recapitalised to provide the necessary financial resources to revive its business and the appeal will lengthen the completion time for the rights issue exercise. The Company will proceed to implement among others, its rights issue exercise after the delisting of its securities on 7 November 2012. The above decision is made in spite of the Board disagreeing with Bursa Securities’ decision to reject its proposed regularisation plan as the Board believes that the PN17 status of the Company was primarily caused by frauds committed by the former management and not because of business failures. Further, the Board believes that the Company’s businesses are still intact. Thus, a recapitalisation of the Company’s capital structure would be of paramount importance as required by Paragraph 3.1 (a) of Practice Note 17 of the Listing Requirements. In view of the above, the Board has decided not to appeal against Bursa Securities’ decision and would focus its efforts to recapitalise and/or restructure the Group without further delay as such delay may allow further business deterioration that may no longer be remedied. This announcement is dated 2 November 2012. This entry was posted on Wednesday, November 7th, 2012 at 8:11 am	and is filed under stock market. You can follow any responses to this entry through the RSS 2.0 feed. Both comments and pings are currently closed.